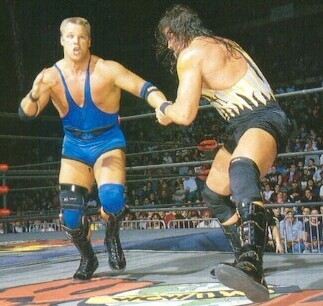 Early 1996: WCW began running seemingly endless vignettes hyping the eventual debut of something called “Blood Runs Cold”.. 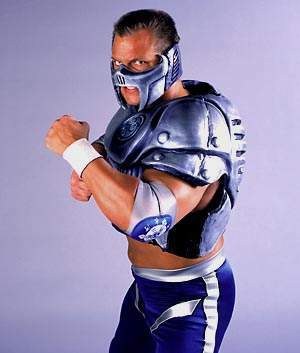 Early 1997: Glacier (aka Ray Lloyd) finally debuted and (figuratively) fell flat on his face, but they continued to push the gimmick..
~~~Glacier had an impressive entrance, equipt with fog, snowflakes and lasers racing accross the arena..
James Vandenberg (Jim Mitchell) debuted with Mortis (aka Chris Kanyon) to feud with Glacier..
March 16, 1997 – Uncensored 1997: Glacier beat Mortis..
May 18, 1997 – Slamboree: Glacier beat Mortis by DQ when Wrath (aka Bryan Clarke) appeared..
June 15, 1997 – Great American Bash: Glacier defeated Wrath..
Glacier was eventually overpowered by his nemisis’ until 3-time Karate champion Ernest Miller jumped the rail and saved him! 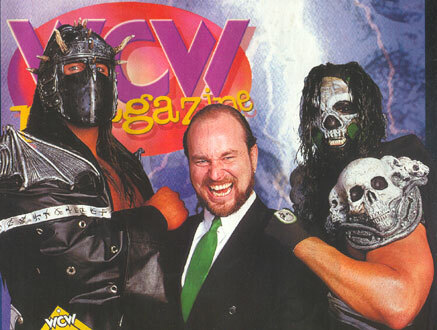 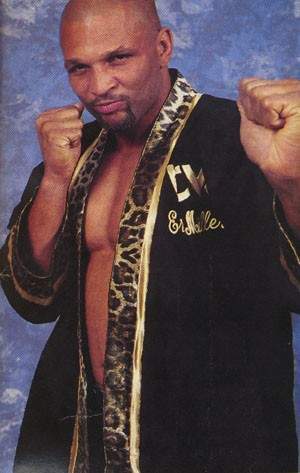 July 13, 1997 – Bash at the Beach: Mortis & Wrath beat Glacier & Ernest Miller..
September 14, 1997 – Fall Brawl: Wrath & Mortis defeated Meng & The Barbarian..
October 25, 1997 – Worldwide: Glacier & Ernest Miller over Doc Dean & Manny Fernandez..
December 13, 1997 – Worldwide: Glacier over Mortis w/James Vandenburg after the Chronic Kick..
November 23, 1997 – World War III: Meng & The Barbarian defeated Glacier & Ernest Miller..
November 22, 1998 – World War III: Wrath demolished Glacier..
All of the Blood Runs Cold characters were created by AFX studios (owned and run by Andre Frietas)..
Glacier went on to become a glorified jobber, then took up a managerial role as “Coach Buzz Stern”..
Mortis lost the mask and Chris Kanyon had a pretty successful run, and landed a job with the WWE in 2001.. 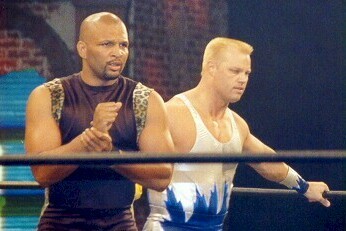 Wrath dissappered and returned using the same name with a monster push that did not catch on..
~~~Wrath then began using his real name (Bryan Clarke) and teamed with Brian Adams as KroniK..
James Vandenburg went on to ECW-fame as “Sinister Minister” and TNA-fame as “Minister Jim Mitchell..
Ernest Miller went out on his own with a great push until WCW’s death, then signed with WWE as an announcer in 2003..